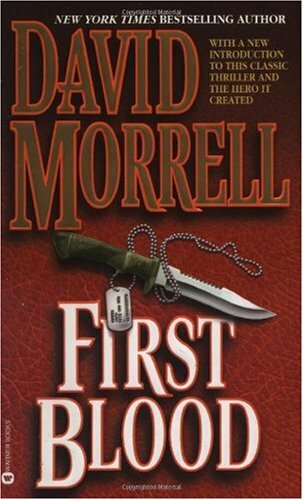 What's the Difference between First Blood the Book and First Blood the Movie? Rambo comes back to town three times before he's finally arrested by the cops. Teasle arrests him after he turns back into town the first time. Galt is a younger cop and is killed by Rambo when escaping the police station. Galt is an older, hardass cop and dies later in the movie. Rambo is shot in the chest by Teasle during their final battle. Rambo doesn't get shot. Rambo plans to kill himself by detonating a stick of dynamite. He sees Teasle still following him and decides to fight and have Teasle kill him in a more honorable way. Rambo shoot at Teasle to draw his fire, but hits him and he is near death. Now he is afraid that he won't die because he can't light the fuse of the dynamite. Rambo never wants to kill himself. He only wants to kill Teasle. He does shoot him from underneath the police station. He crashes through the skylight and lays dying.